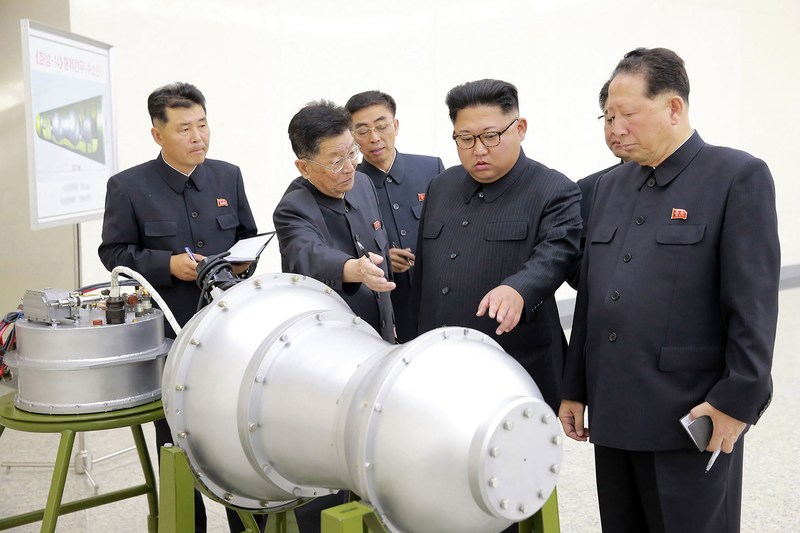 North Korea Says It Has Developed 'Super Explosive' Hydrogen Bomb : The Two-Way In photos released by country's state-run news media, leader Kim Jong Un is seen inspecting a "super explosive" nuclear weapon that's purportedly capable of being mounted on an ICMB. This undated picture released by North Korea's state-run news agency on Sunday shows North Korean leader Kim Jong-Un looking at what Pyongyang claims is a hydrogen bomb, which can be loaded into the country's new intercontinental ballistic missile. North Korea says it's developed a "super explosive" hydrogen bomb that fits on an intercontinental ballistic missile, according to multiple media reports citing the country's state news agency. During a visit to the country's Nuclear Weapons Institute, North Korean leader Kim Jong Un watched as the purported H-bomb was loaded into a new ICBM. "Kim, according to the statement, claimed that 'all components of the H-bomb were homemade ... thus enabling the country to produce powerful nuclear weapons as many as it wants.' "
In its report, KCNA (via Xinhua, China's official news agency) also said the North Korean leader "guided the work for nuclear weaponization on the spot," as part of "the final-stage research and development for perfecting the state nuclear force." Following the country's claim of an accelerated nuclear arsenal, President Trump spoke with Japanese Prime Minister Shinzo Abe about efforts to maximize pressure on North Korea. "The two leaders reaffirmed the importance of close cooperation between the United States, Japan, and South Korea in the face of the growing threat from North Korea," the White House says. "President Trump noted that he looks forward to continued trilateral coordination on the margins of the United Nations General Assembly." The conversation on Saturday, as Trump was returning from flood-ravaged Louisiana, is the third time the two leaders have spoken since Tuesday, NPR's Scott Horsley reports. The North test-fired two long-range missiles in July, driving the United Nations Security Council to adopt a resolution last month to impose new sanctions on Pyongyang. In response to the heightened sanctions, Pyongyang said it was ready with "ultimate measures." A day later, President Trump threatened to meet North Korea with "fire and fury." But as NPR's Elise Hu reported, Jenny Town, the assistant director of the U.S.-Korea Institute at John Hopkins' School of Advanced International Studies says a policy of increasing pressure is misconstrued as "hostility," which, Town argues, "justifies its need for nuclear weapons." As the Two-Way reported last month, U.S. intelligence analysts believe North Korea has already developed a warhead that can be placed on its ballistic missiles, including an ICBM capable of reaching U.S. territory.